So John Ende and Lois Springsteen will be filling three-year terms for the two available normal board positions, while Jake Kassen will be filling the one-year RBA Liaison position. Many thanks to Pete, John, Lois, and Jake for being willing to stand for election and serve RUSA. The RUSA Board has approved allowing electronic devices to be used to provide proof of passage on RUSA Permanent rides, subject to certain requirements, and so long as both the perm owner and the rider agree. Traditional validation - receipts, info controls, etc. - are always acceptable. Details in the Rules for Permanent Riders and Rules for Permanent Route Owners. We hope this will provide a convenient alternative for those riders and route owners interested in using it. If you have questions after reading the rules, you can submit them to EPP@RUSA.org. The RUSA Board has approved events submitted thus far for 2018. This includes ACP- and RM-sanctioned events, for which the deadline to submit was 9/30. View the 2018 schedule (and remaining 2017 events) via Search for Rides. A big thanks to our Regional Brevet Administrators for providing us a wealth of events to ride in 2018! Voting for the 2018 Board including RBA Liaison is now closed. The voting period extended through November 15. Please see the 2018 Election page for candidates' statements, which are still online, if you are interested. Two positions on the RUSA Board of Directors will become available at the end of the year. The term of Susan Otcenas (eligible for re-election) is expiring. The term of Lois Springsteen (appointed to serve the last year of a three year term vacated by a prior Director) is also expiring. Lois is eligible for election. Members may nominate up to two current RUSA members to run for those two positions. Additionally, RBAs may nominate an RBA for the position of RBA Liaison. Central FL RBA Paul Rozelle currently holds this position and is eligible for re-election. A nomination form can be found on-line here. 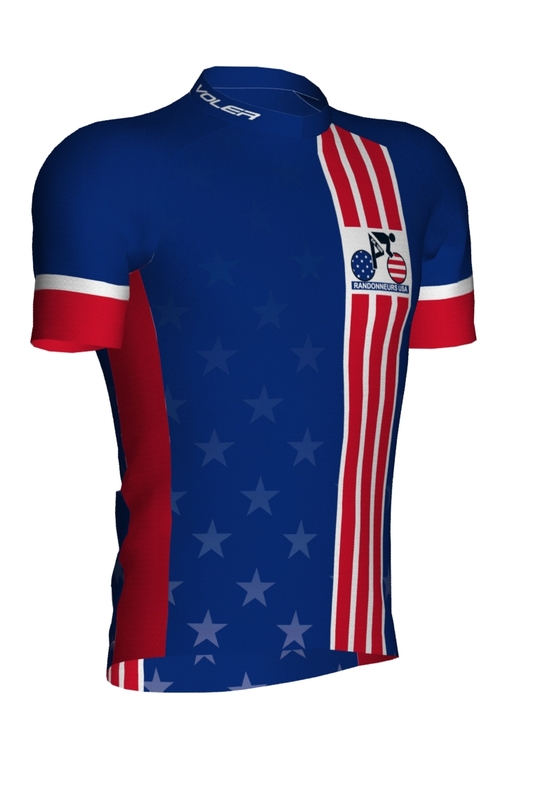 New RUSA Jersey available for purchase! RUSA has a new jersey! Check out ordering details and sizing information here. You order directly from Voler, and they ship directly to you. 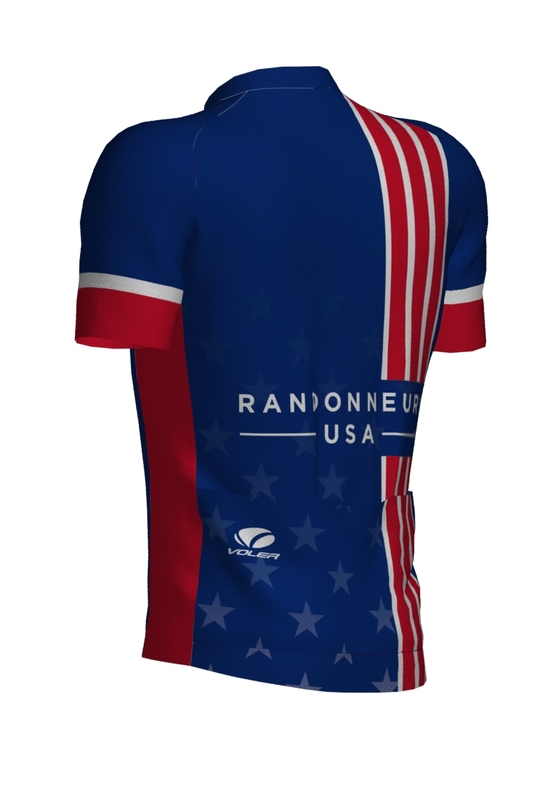 Voler -- who produced our 2015 PBP jersey and the jerseys for many 1200s -- makes these items on-demand so you can be kitted out in the latest randonneuring style about two weeks after ordering from their website. Choose from either a short-sleeve or long-sleeve style, and stay tuned as we continue to roll out new and redesigned RUSA apparel offerings! SR 600 program chair Sophie Matter tells us, "We hope that more riders will try, and achieve the challenge. Now the Randonneur option opens up to a wider audience. The challenge is still very difficult, especially since self-sufficiency is required." Bill Beck is the US representative for the SR 600 program, in case you have any questions (see Search for Officials). 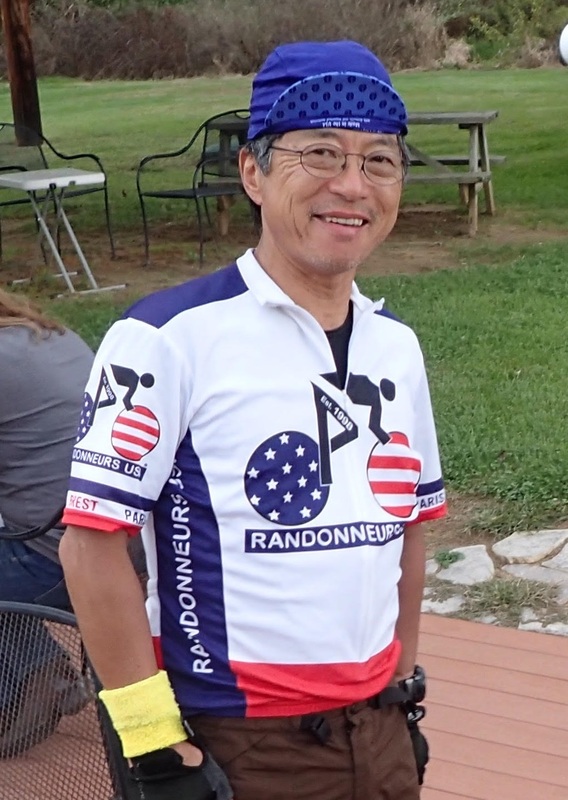 We give our heartfelt condolences for the loss yesterday of Audax Japan president Mitsuaki "Micky" Inagaki in a crash while riding the New Zealand 1200. Micky was known to a number of RUSA members from the four RUSA 1200k's he completed, plus others around the world. He was an inspiring rider to us all and a friend to many. In Northern California there is a robust ultra-cycling community, of which Randonneuring is a large part. Many riders have tested their limits doing club rides working up to 100 miles, then joining others on club hosted double centuries and finally found themselves in the middle of the night miles from the lights of towns riding toward the finish of a 600km. A number of these riders too have had the good fortune to have been riding those events alongside Bruce Berg (RUSA #1349) who has been a fixture in Northern California ultra-cycling for close to two decades. Bruce began riding brevets in the early years of RUSA, and has been a finisher at PBP (2003 and 2007) as well as riding domestic 1000km and 1200km events in the West. Bruce is a member of the California Triple Crown Hall of Fame for having ridden over 50 organized double century events. Bruce has also been a prominent volunteer on long distance events supporting the Davis Gold Rush Randonnée (Davis Region), The California Central Coast Randonnée (Santa Cruz Region), and the Golden Gate 1000km (San Francisco Region) several times. 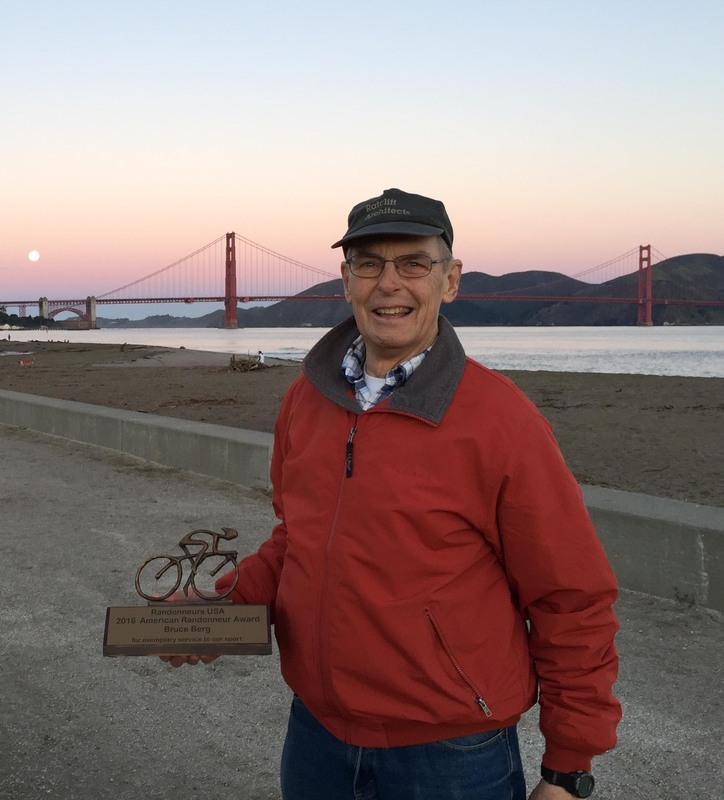 Though Bruce is no longer able to ride brevets, he continues to support the San Francisco Randonneurs, often volunteering for the tasks least likely to get volunteers. The description of the qualities RUSA looks for in candidates for the American Randonneur Award mentions the word 'growth' in regard to our niche in the cycling world, and there are a number of ways someone can foster the growth of our sport: supporting and encouraging riders new to randonneuring, helping local clubs flourish so that there are clubs to host brevets, and pitching in on those rides to make them happen. The randonneuring community in Northern California has had the good fortune to have Bruce be involved in every aspect that nurtures the growth of our sport. In 2016, the Board formed a committee, comprised of Deb Banks and Jennifer Wise, to evaluate RUSA’s logo. The committee solicited designs from members and while that process garnered a number of creative submissions, none of them were compelling enough to merit replacing the existing logo. During this project, the RUSA store did not restock logo-branded items. With this project now at an end, we will re-stock some logo items in the online store and work with an external vendor on apparel designs. Deb and Jennifer, and the members who answered the call for logo submissions, are commended for their hard work and dedication to this effort. If RUSA revisits the logo in the future we will involve our membership in the process.